Black Mountain Sand recycles and reuses up to 98% of the water used in our operations, helping us meet the high-quality frac sand needs of customers with as minimal stress on the local water system as possible. The U.S. oil and natural gas industry is in the middle of a production renaissance with daily output reaching numbers not seen in fifty years. Driven by continued advancements in drilling and completion techniques, hydrocarbon production is expected to continue to surge, reaching 11.2 million barrels of oil per day in 2019. The Permian Basin is leading this charge in production gains. 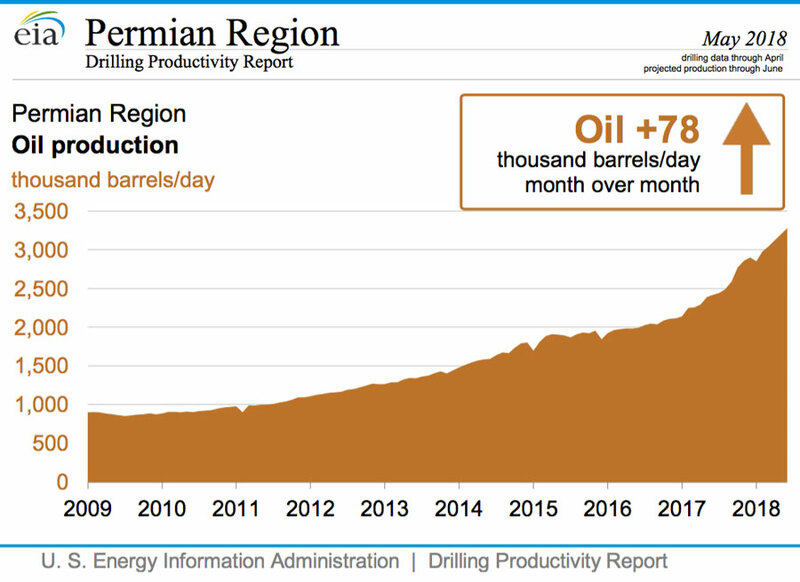 As the largest hydrocarbon producing basin in the U.S.––and second most productive oilfield in the world––the Permian produces an astonishing 2.8 million barrels of oil per day and climbing. But while oil is plentiful in the region, water is scarce. The basin, which sprawls across 75,000 square miles of West Texas and Eastern New Mexico, is essentially a desert with most parts receiving less than fifteen inches of rain per year. Communities and commercial operations alike are primarily dependent on an interconnected system of aquifers, where water pumped from one could potentially reduce the flow in another. The scarcity of water creates quite a conundrum in the Basin: the recent boom in oil and natural gas production––and the associated uptick in economic growth and prosperity––is due in big part to water. Water is a key component of hydraulic fracturing, which has helped unleash a flood of oil and natural gas from shale deposits across the United States. With fracking, a water-based mixture of sand and chemicals is injected into a wellbore at high pressure, forcing fissures within a rock to open thus releasing the hydrocarbons held within. Approximately 90 percent of fracking fluid is water. The remaining components are frac sand (~9.5 percent) and additives (0.5 percent). Since the start of the Shale Revolution, water use in the Permian has skyrocketed, rising six-fold in ten short years. Today, fracking the average Permian Basin well requires between 500,000 and 700,000 barrels of water, which equates to over 21 million gallons per well. As operators continue to fine-tune their drilling and completion techniques, the amount of water per well is expected to climb. Water demand is forecast to reach the 100 billion gallons a day mark by 2020––almost triple the amount of water used in 2017. The influx of regional sand mines is putting even more pressure on the local groundwater system with mining operations now vying for their share of this precious resource. Given our potential impact on groundwater supply, one of our first orders of business was to commission a third-party water engineering study. The purpose of the study was to better understand the groundwater supply within the immediate vicinity of operations in Winkler County. Using this information, we worked with engineers to design and implement a well field that provides adequate groundwater to run our operations while also helping promote the long-term sustainability of regional and local groundwater resources. Once we had a good understanding of where our water supply was coming from, we turned an eye towards figuring out how best to use it. Water is an integral component to producing high-quality frac sand. Utilizing a wash-water loop, raw sand is washed to remove silt, debris, and clay particles. The sand slurry is then further processed through a series of screens and density separators to sort the sand by particle size. At our Permian Basin facilities, Black Mountain Sand processes both 100 and 40/70 mesh sands for use in commercial operations; any sand that is not to spec is stockpiled for future use in land reclamation. Our Permian mines are designed to maximize water usage throughout the frac sand manufacturing process. Two 1-million-gallon freshwater holding tanks feed the system in a closed-loop to wash and sort sand, which results in a continual source of used turbid water. 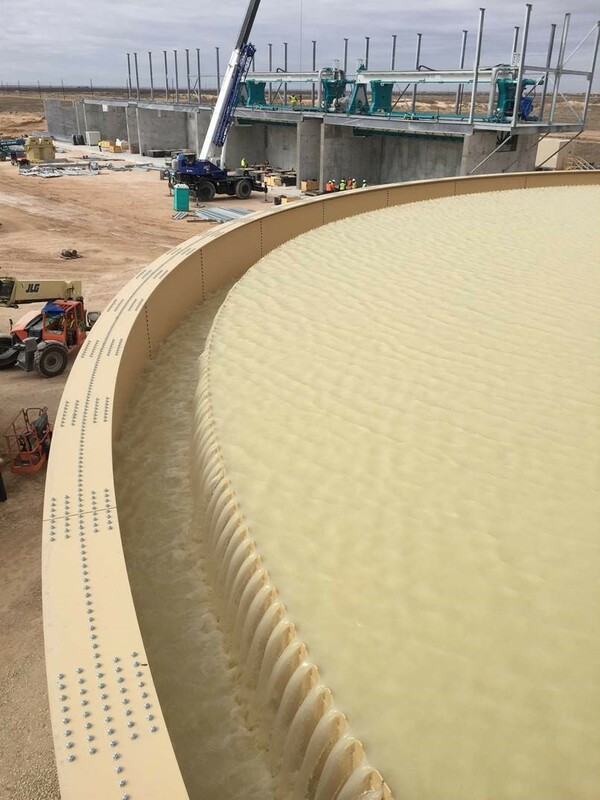 Instead of routing the used, turbid water into settling ponds, our system captures it in a settling tank where solids are concentrated into a mud containing anywhere from 25 to 35 percent solids. Next, this mud is pumped at high pressures into filter press membranes where filter press technology squeezes water out of the solids. Thus, instead of losing water to evaporation and ground seepage, our system feeds this recovered water back into the holding tanks to be used again and again. In addition, our wet sand is stored in a specially-designed decant building while awaiting final processing in the dryers. This step helps prevent water evaporation while promoting efficient draining; as water drains from the sand, that water is funneled through a drainage system in the floor directly back into the holding tanks. And, by promoting better drainage before the drying process, we save energy because our sand requires less energy to be dried. 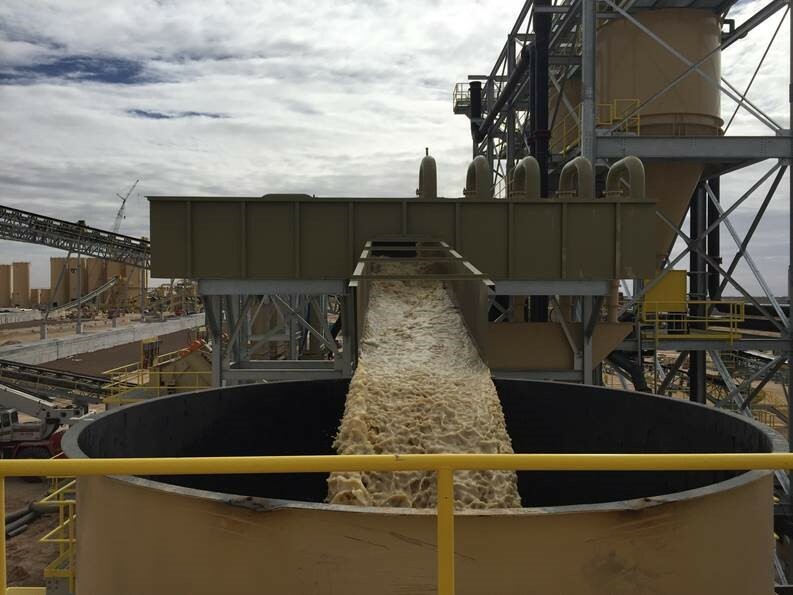 All told, Black Mountain Sand recycles and reuses up to 98% of the water used in our operations, helping us meet the high-quality frac sand needs of customers with as minimal stress on the local water system as possible.